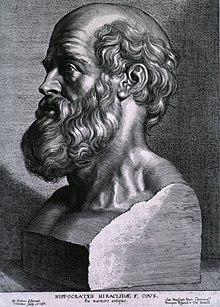 Hippocrates (c. 460 – c. 370 BC) was a Greek doctor who is called the "father of medicine". He was the first person to teach that people got sick for scientific reasons. Previously, people believed that disease was caused by angry gods. Many of Hippocrates' writings are still important to doctors. For example, patient confidentiality, meaning that doctors can only discuss a patient with the patient themselves. Another of his ideas is to never knowingly lead a patient to suffering or death. These kinds of ideas are part of medical ethics. ↑ Grammaticos PC, Diamantis A (2008). "Useful known and unknown views of the father of modern medicine, Hippocrates and his teacher Democritus". Hell J Nucl Med 11 (1): 2–4. PMID 18392218. This page was last changed on 5 July 2018, at 07:44.